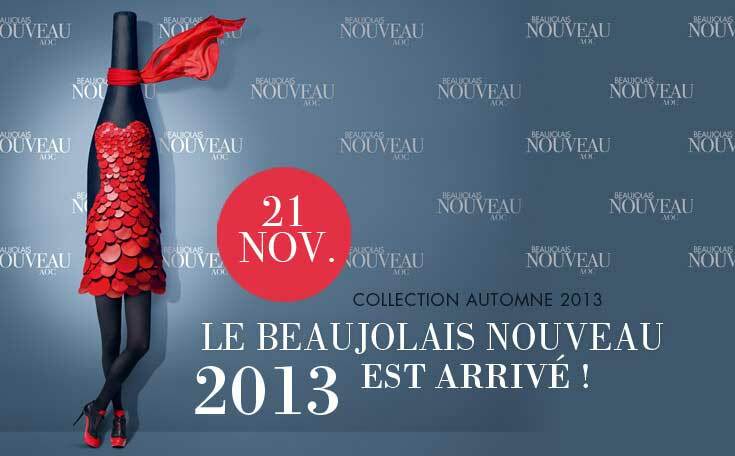 Today is the release of Beaujolais Nouveau (New Beaujolais). So what’s this all about? Every year, on the third Thursday of November, the Beaujolais Nouveau is released at 12:01am in France. It is the earliest wine of the year, sold just 6 weeks after it’s been harvested. It is a very good occasion for people to celebrate and taste this new wine. Everywhere in France, there are fireworks, festivals and tastings in cafes and restaurants. This celebration has also been exported to other countries and the Beaujolais Nouveau can now be found all over the world at the same date. Last year, events were organised in no less than 120 countries! Beaujolais is a region situated in eastern France, just South of Burgundy. Most of the wine produced there is red, from the Gamay grape. Beaujolais Nouveau can be released early thanks to a making process called carbonic maceration: the grapes are put into the vat, uncrushed and the fermentation process begins within the grapes, which are slowly crushed by their own weight, and then burst. This process extracts fruit and colour, but doesn’t extract the harsher tannins from the skins. That is why Beaujolais Nouveau is made for early consumption. The tasting notes are usually very juicy and fruity with a vibrant purple colour. Beaujolais Nouveau day is a cultural event with a lot of controversy around it. Some people say it is a lot of fuss for a wine that is not even very good. But whether you like it or not, the Beaujolais Nouveau is still a great way to get together and have fun around a glass of wine. And this year Beaujolais Nouveau seems to be very popular again. For the 2013 marketing campaign, Beaujolais Nouveau was associated with the fashion world as a fashion student created a Beaujolais Nouveau dress to highlight the parallel between the robe of the wine and a 'robe' (the French word for dress). A contest was organized on Facebook to choose the model who will wear it and be called Mademoiselle Beaujolais. The winner, Cindy Forissier, wore the dress at the Beaujolais Nouveau release and will be signing a contract with a model agency. An inventive marketing campaign, as usual! Waitrose Wine Direct already have an exclusive parcel of the 2013 Beaujolais Nouveau available to buy at just £7.99 per bottle! You can even use our £15.00 voucher code to make an additional saving this November. Are you one of the privileged few who have already tasted this wine? Let us know your verdict in the comments below.